I have an itchy rash! Scabies? Scabies is a common contagious skin condition caused by a tiny mite that burrows in the skin. The most common symptom is an itchy rash, worse at night. 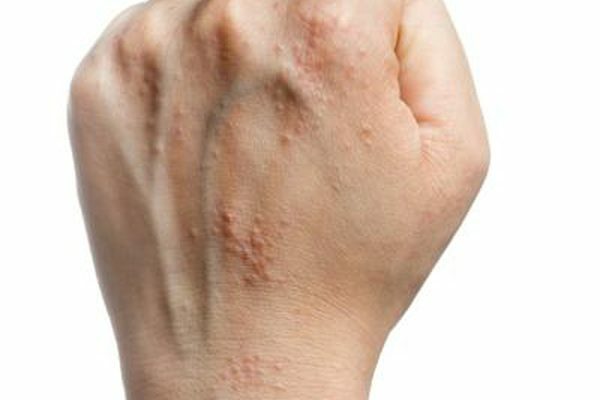 The rash is usually on the hands, breasts, armpits, genital area and waistline. Scabies can affect everyone. It is easily spread from person to person by close physical contact. Personal cleanliness is not an important factor in scabies transmission. The red bumpy itchy skin rash leads to frequent scratching which may lead to a bacterial infection. Transmission of the mites involves close skin-to-skin contact. The scabies mite crawls, it does not jump or fly. It is unlikely to catch scabies by shaking hands or sitting next to someone with scabies. Sexual contact is a common form of transmission, but any prolonged skin to skin contact will spread it. Animals can get mange, an animal form of scabies, but this form of scabies is not contagious to humans. We only get it from other people. Scabies is usually easy to diagnose by an exam alone. The treatment is a prescription cream that is usually very effective. It must be used properly. The cream called Permetherin, must be applied to all skin surfaces from your neck to the soles of your feet. The cream should be left on overnight for 8 to 14 hours and washed off in the morning. It is extremely important to put the cream on every square inch of your body: not just where the rash is. That includes applying it under your nails and in the buttocks and genital area. If you wash your hands or any other area during the treatment period, new cream must be applies immediately. Family members may be infected and will need treatment at the same time. Be sure to wash your clothes and bed linens in hot water. It is not usually necessary to clean sweaters, jackets, furniture, drapes, or rugs. After one treatment you are usually not contagious The scabies mites will be gone in a matter of days; however, the rash and itching may persist up to four weeks after treatment. An alternative to the Permetherin cream is a pill call Ivermectin. More recent studies have shown it to be very effective. See our Physicians and P.A.s at Doctors Urgent Care for the highest quality medical evaluation and treatment. We are familiar with and treat scabies and we are open seven days a week.